Fever is a temperature of 100.4 or higher and when most students are contagious. To return to school a student must be fever free for 24 hours without needing medication such as acetaminophen (Tylenol) or ibuprofen (Motrin) to reduce the fever. Vomiting is the forceful expulsion of stomach contents through the mouth. To return to school a student must not have vomited for 24 hours. Diarrhea is a sudden onset of three or more loose stools in a day. To return to school a student must be free of diarrhea for 24 hours. 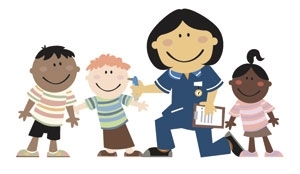 Please know that a student will be sent home if he or she presents to the nurse with any or all of the above symptoms. If your child is going to be absent from school for ANY reason, please call to let us know. The absentee line can be reached by calling 508-987-6066 then #2 when prompted. A message can be left on the absentee line at any time (24/7). For any extended illnesses please be prepared to provide a doctor's note. All prescription (Rx) medication that must be given in school requires a physician or nurse practitioner order. The student's physician or nurse practitioner can use his or her own order form or the form that appears below called "medication order form". All medication administration (over-the-counter-OTC or Rx) requires parental/guardian consent. Please find a consent form below called "OTC or Rx consent form". For the safety and welfare of all students all medication (OTC or Rx) should be brought in by a parent or guardian, labeled with the student's name in the original, unopened packaging. Please be aware that cough drops are not allowed to be given to any child under the age of 12 years according to the annual medical orders provided to all district nurses by our school district physician consultant. Therefore, I would ask that no parent send his or her child into school with cough drops.